Just about anything would be delicious when smothered in a spicy peanut sauce, but this bold blend is particularly invigorating. 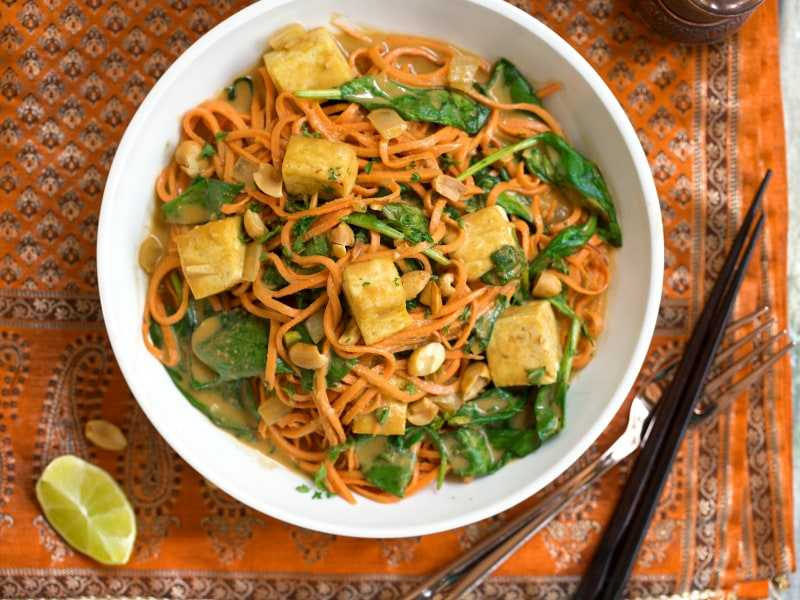 Sweet potatoes take the place of starchy rice noodles in this completely plant-based entrée, complete with protein-packed tofu for a fully balanced meal in one bowl. The sauce can be prepared and saved for up a week in the fridge, so you can throw together this delicious dinner in mere minutes. Allergic to peanuts? Try sunflower butter or tahini instead! Per Serving: 631 calories; 45g fat; 41.5g carbohydrates; 26g protein; 0mg cholesterol; 942mg sodium. I consider Pad Thai the ultimate comfort food, at least as far as a mid-Michigan guy can legally consider Thai Food to be "comfort food." I was very skeptical of this. Rice noodle is so integral a part of the pad thai experience. I almost wish this had been called something else, because judged on its own merits, it's a reallyk tasty dish. 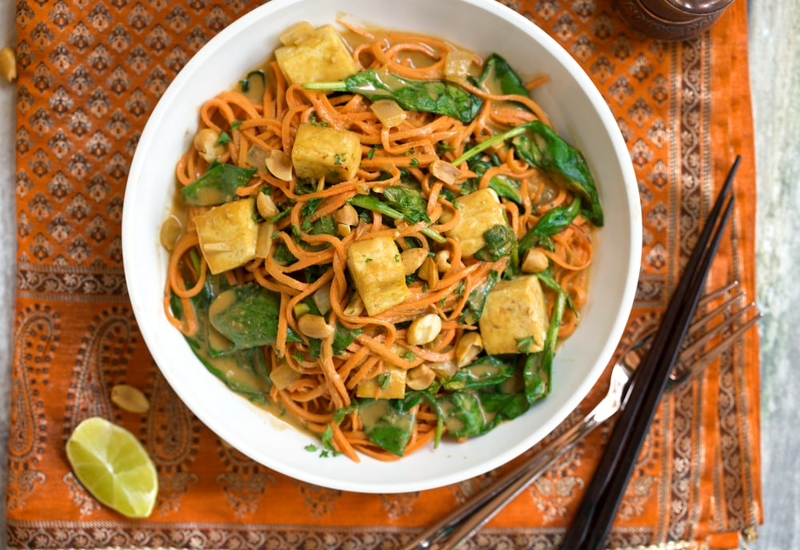 The sweet potato really does work well with the pad thai flavors. But in the end, I was left wanting actual pad thai. I'm going to call this something else. Maybe just "Steve" or something. Very tasty! 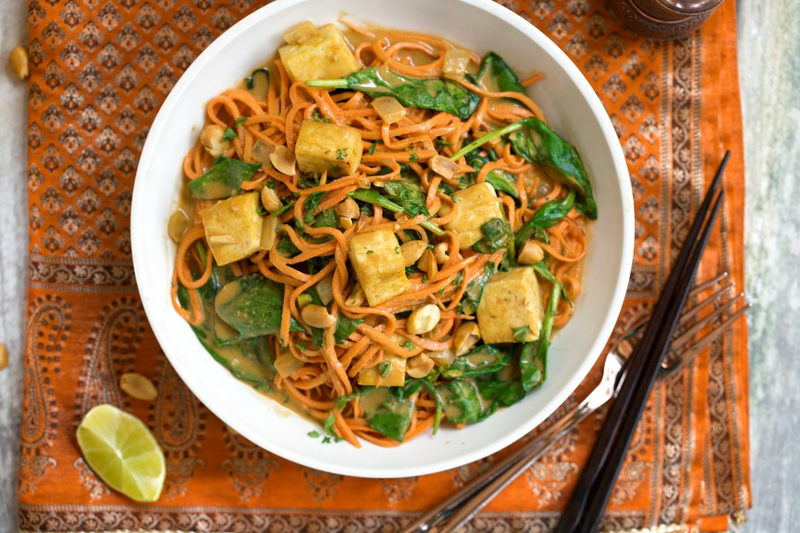 Do be sure to check the doneness of the sweet potato noodles, as the recipe says; they're tough if undercooked. We modified a couple things for laziness and cheapness: eg, we used ginger and garlic powder instead of fresh so that we didn't need a blender to mix the sauce, and we used frozen spinach. We also (sadly) omitted the sriracha for the sake of our small kids. But it was still great. Yum! Definitely a very different flavor from normal Pad Thai, but so delicious. Loved the peanut coconut sauce. Soooo easy and super tasty! I'll be making this again and again! Very tasty! The fresh ginger adds great flavor!! So delicious and hardy! Might pre-blanche the sweet potato noodles to cut down on cook time. I also used 28oz of sweet potato noodles and extra firm tofu for extra protein. Husband approved.